Today was match day! England v Italy. The match was at Telford Stadium so we had a 50 mile journey from St. Georges Park to get there. It was a rather cold day to be outside but it wasn’t shown by any of the excited school children that flooded the ground, ready to watch the game. Before the match began outside the stadium, Continental Tyres were running a Conti Fan Zone. A variety of football activities were being run for the energetic children. I had a go at measuring the speed of my kick. On my first go I fluffed it and didn’t even hit the target (that’s why I play in goal!) but on my second go I managed to get 29mph which was quite good. I had to do a piece to camera about what went on before the match and interviewed two Birmingham City Ladies who were taking part in the activities. Me and my cameraman David positioned ourselves by the team dugouts, ready and waiting for kick off. When the game finally kicked off it was a fast, exciting game. Both teams were equal and no team was particularly dominant. 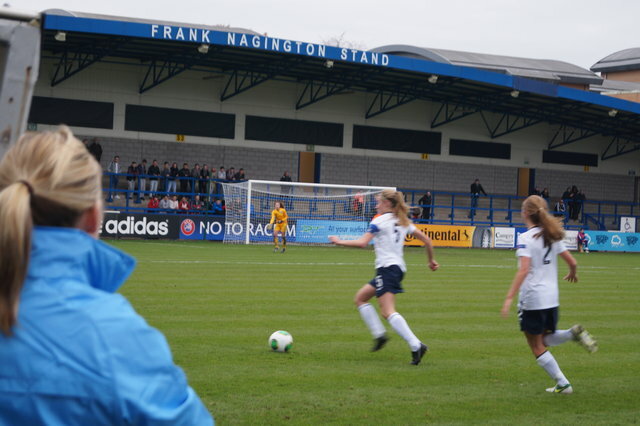 The England captain, defender Leah Williamson was a stand out player as she was clearly comfortable on the ball and lead the team with ease. At half time it was 0-0. For the second half me and David retreated to the press box, due to the days coldness, where Simon and Dad had been watching the game and famous footballer spotting. I had to do some reporting to the camera at half time about how I thought the match was going. The second half was just as gripping and as nail-biting as the first. Unfortunately England conceded an untimely goal off a deflection. England continued to battle throughout the second half and continuously tried to win themselves back a goal, they came staggeringly close to scoring again but unluckily when the final whistle blew, Italy won 1-0. The score didn’t reflect the game, a draw would have connoted the game more suitably. After the game, I got the chance to ask Lois Fidler a question at the after game press conference. Following the press conference I then got the opportunity to interview the current England Ladies Manager, Brent Hills, who was lovely and chatty, I still can’t believe I got the chance to interview him. 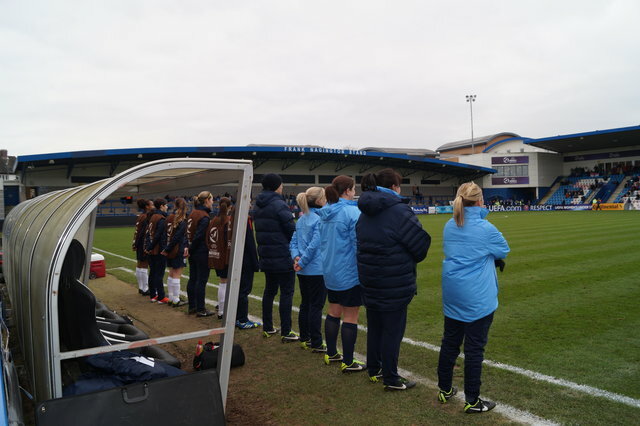 I was also fortunate enough to be able to interview Alex Scott, England international, Dave Sampson, Bristol Academy Ladies Manager and four of the Under 17 girls, Leah Williamson, Keira Walsh, Chloe Kelly and Molly Rouse. I was overwhelmed by the people I got the chance to talk to about the game. As the day came to a close it was time for us to go back to St. Georges Park after a long, jam-packed, thrilling day.